Page the Renal fellow, please! Much has been made about the decline of physicians entering a career in nephrology over the last decade. To be fair, this is a predicament with multiple factors at play. One such factor is work-life balance. It has recently been shown that ~50% of nephrology fellows show some degree of dissatisfaction in their career choice secondary to long work hours (see Shah et al). Furthermore, nearly a quarter of fellows in other internal medicine subspecialties indicated that they did not choose nephrology for concerns about negative lifestyle perception (see Jhaveri et al). One contributor to the work-life balance perception is the quantity of pages received by clinical fellows. This is especially concerning for after-hours pages as they have the greatest potential to disrupt the sleep and personal activities of a busy fellow. Sandal et al from the University of Rochester present two months of data from their institution in which they examine this very issue in a recent letter to the editor in AJKD. This group examined 615 pages over a 61-day period (average of ~10 after-hour pages per day) as part of a quality improvement project. This group found that ~25% of after-hour pages were in regard to patients already seen by the consult service. The majority of these calls resulted in no new intervention. It is intriguing to speculate that many of these pages, leading to potential interruptions in sleep, could have been avoided with better communication between the primary team and nephrology consult service. They also found that another ~35% of calls were in regard to ongoing dialysis-related treatments, and again a majority of these calls resulted in no new intervention. Sandal et al wondered if improvements in dialysis-related order sets could have lessened the burden of pages received in this area as well. I applaud these authors for examining this issue. It would be interesting if this group could develop an intervention, such as an educational initiative aimed at improving team communication skills or existing order sets that would lead to a noticeable reduction in the number of after-hours pages. It would also be interesting to see how pages to fellows in this training program compare to fellows in other disciplines, such as cardiology or pulmonary-critical care. This would allow a way to examine how pages to nephrology fellows compare to fellows in others fields in terms of both quantity and quality. How initiatives like these impact work-life balance and ultimately career satisfaction will also be important to examine. Other nephrology training programs need to explore factors such as these in order to make positive strides at improving the work-life balance of their trainees. Choosing a career in nephrology is a rewarding experience, and I hope we will start to see more interested applicants pursuing nephrology training. The factors involved in choosing a career in nephrology are complex, and fixing problems both real and perceived will take time to resolve. Simple strategies such as this one could play a positive role in turning the tide to ultimately increase interest in nephrology. 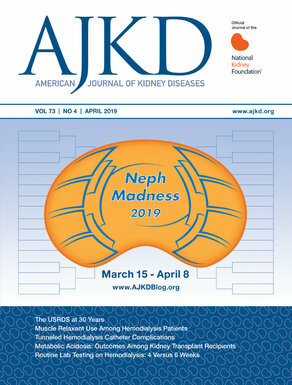 Please see the related post on this article.To view the article full-text or PDF (freely available), please visit AJKD.org.